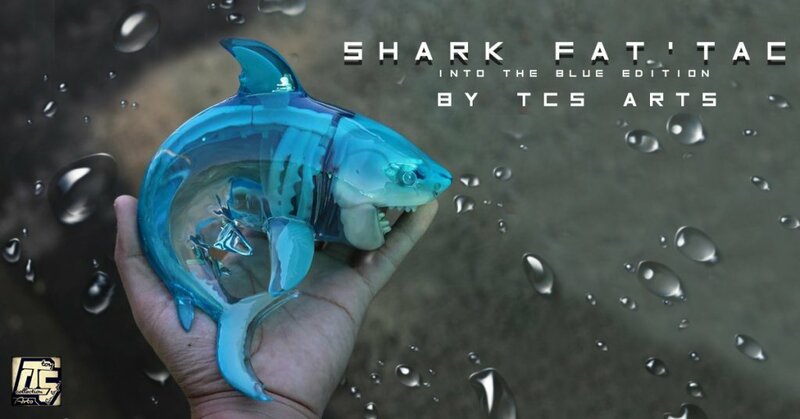 Back in March 2017 TCS Arts took a big bite outta the resin art collectables game with his impressive Shark Fat’tack. Like we’ve already said last year, the impressive looking double cast SHARK Fat’tack. The prototype looked fantastic and TODAY TCS Arts gave us all an update on a few changes. Like we said before in the previous article HERE. We’ve seen plenty of double casting, exposed innards over the years but this Shark Fat’tack by Chawalit Siribundasak of Thailands TCS Arts is pretty impressive the exposing rib cage and parts of the skeleton, right down to the expression that TCS Arts has given to Shark Fat’tack is a mean mother fxxker. The double casting for us tops it off especially around the head of the Shark Fat’tack. pre-orders from last year are starting to be finished and rolled out to collectors as we speak. BUT did TCS Arts just tease a new Edition on the horizon?! Hopefully, it’s a new colourway especially for collectors who missed out on one. Who can deny the lovely blue tint! KILLER colour. If you are waiting for your Shark Fat’tack shipping should start soon. Find TCS Arts on Facebook.